Almost a year ago, I made one of the best decisions of my life thus far. My boyfriend and I adopted a puppy. It was a big decision as we didn’t know if we were ready for that level of personal and financial responsibility given our schedules, etc. 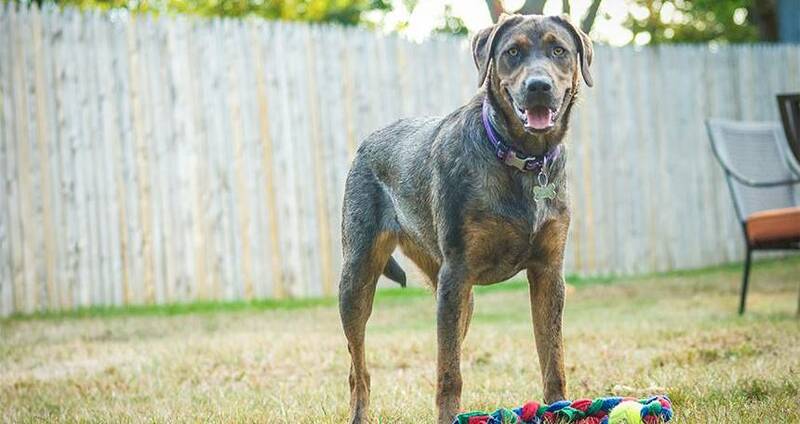 To make a long story short, the organization we went through basically “matched” us with a 12-week-old lab-catahoula mix named Ruby. As soon as we saw her picture, we knew the answer was “yes.” Every single day of the past 11 ½ months has been better than any day preceding it. Ruby has brought us so much love, joy, and laughter, which we didn’t even realize we were missing. Over the past almost year, I’ve gotten to know her habits, quirks, likes, loves, and dislikes. As we know, animals are driven by their instincts- what helps them survive and what makes them feel good. Beyond all the happiness she has brought into our home, she has also taught me a thing or two, or ten, especially in regards to taking care of myself and learning to let go a little. I have found that many of these lessons relate to health and fitness and I think we can all learn a little something from Ruby. When Ruby has something that needs attention physically, she stops whatever she may be doing to tend to that issue. Be it licking her tender paws after an hour at the snowy/icy dog park, plopping down for a nap when she’s tired, scratching when she’s itchy, or what have you, she knows that if her body needs attention, she needs to address it- now. As humans, we have so much going on in our lives. How often do you seek professional help when you have a physical issue? How often do you ice or stretch sore muscles? How often do you take a nap because you’re exhausted? Probably not as often as you need to. Ruby has taught me that if something needs attention physically, take care of it now, before it gets worse. Piggy backing on the above, what’s the first thing dogs do when they wake up? Streeeettttttccccch. Why? It feels oh-so-good and it is so good for them to awaken those muscles before doing anything else. Same for us. Our muscles are stiff from the night’s sleep and it can be very beneficial to wake them up before going about our day. As much as Ruby loves playing on her own in the backyard, doggie play dates or dog park visits bring out a totally different side of her. She is super enthusiastic and jovial- you can almost see the smile on her face when she’s around her friends. Not only that, but her zest for activity is noticeably higher when other dogs are around. The same can apply to us. Exercising with friends can help make the activity more enjoyable and push us to put a little more effort in. How “fun” is jogging around the track with your headphones in as opposed to, maybe, playing tag with your kids? It may be enjoyable for you to exercise on your own, we all need that “me” time, but how often do you laugh and actually have FUN doing it alone? Ruby has taught me about effort and giving 100% into whatever activity I’m doing. I watch her, and she will just GO until she literally cannot go any longer. Even then, she tries to keep going. Why not? What is there to lose? She can’t plan her future workouts. She doesn’t know if this is her last time going to the dog park forever or if she will be back tomorrow. It doesn’t matter- she makes the most of her experience at that moment. Most of us don’t truly exercise like that. We like to think we give it our all, but do we really? What more could come of our workouts if we gave them all we had every time? So many of us constantly compare ourselves to others. I’m not as skinny as she is, I’m not as fast as he is, so on and so forth. So what?? Ruby couldn’t care less about the abilities or looks of other dogs. When she “exercises,” she makes the most of her 70lbs of pure muscle (at least it feels like pure muscle when she pulls me), and she enjoys every second of it. We suffer from these paralyzing thoughts that if we aren’t the best at something, then it’s not worth doing at all. “I’ll be the weakest person in that class, so I’m just not going to go.” WHAT?? Why does that matter? Just be grateful you are even physically able to exercise. Take advantage of the opportunity you have to improve your health and well-being. Exercise and fitness should not be about who’s the best at what or worrying about what you look like. It should be about improving your health to improve your life. Physical competition is a completely different entity and not everything has to be a competition. On a separate note, but under the same lesson, it’s the simple things in life that make Ruby happy. A belly scratch, playing with a sock, food (of ANY KIND), running around the backyard, or just being near us, they all stem from two things- love and safety. She doesn’t need anything fancy- she just wants a loving, safe home. Not having awareness of material things must be so liberating. This is probably my favorite lesson that Ruby has taught me. I don’t need “stuff” to make me happy. I have everything I need and everyone I love, and that’s truly all I need to be happy.